My big sister Chris is 60 today, but she doesn't want anybody to know, so don't tell anyone. Thanks Barbara W. I'll pass along your wishes, as sis is not a blog-frequenter. Happy Birthday big sister Chris! Thanks Michelle! You have a real gift for making things sound wrong, in all the right ways! 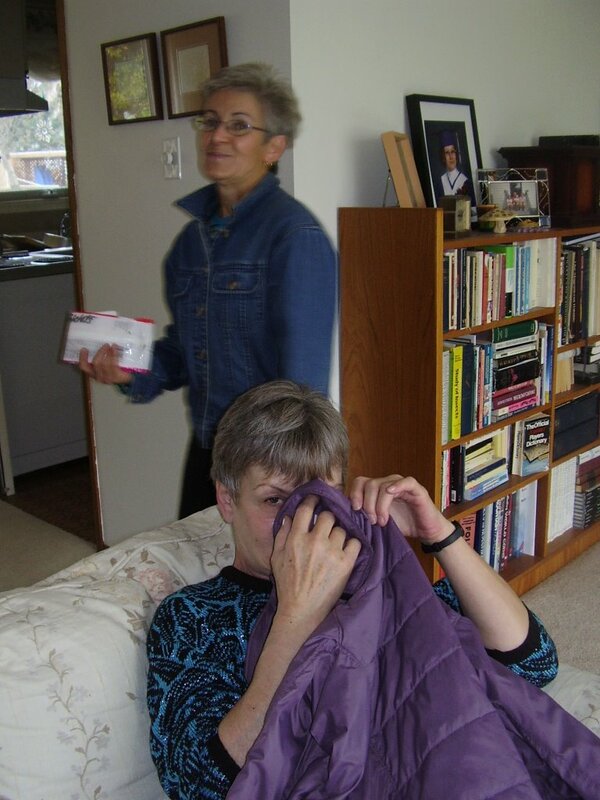 At the age of 60 you need a comfort blanket to carry around, and I see your sister has hers on the photo and she's consoling with it, cause it sounds to me like she's not going to get any consolation from her kid sisters. You are dead on about that, Ben! Chris has the meanest little sisters in the world. I made her one of my specialty cds, so I hope that helps her cope with her encroaching senility.